10 cities, 10 days...all in a fairly small package. Built on Martin's ActiveX weather template...this will work behind a corporate firewall that requires IE proxy setting. The buttons are a bit too "shiny" for my taste though. Thanks so much for this widget. I really don't need weather for 10 locations, but for people who do, this is fantastic. So much info and presented in such a great package. Any thoughts about doing this in different colors? Boss019, I'm with you...they didn't look too "shiny" to me either until Yrgal pointed it out...damn you, Yrgal! So...why 10 cities? Well, in talking with people, on the Net, from all around the globe I wanted a way to quickly "feel" what it's like in their part of the world...sometimes 10 isn't enough. Also since the "last reported" date and time as usually fairly close to the actual time, I'm able to quickly know what time it is in their part of the world. P.S. 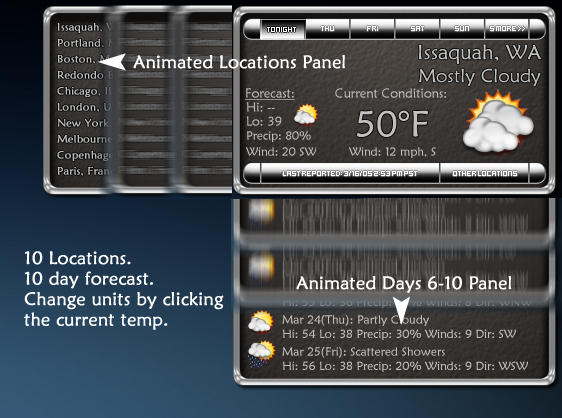 slomo, actually I built the widget to be highly change-able. There are only four graphic files that need to be modified to have a completely different look...I'll leave it to you to figure out the files for now. That was fun! Thanks again for sharing! Have been playing around with DX3, Photoshop etc. all night and the final result turned out like this: Link Think I'll remove the lightening bolt though. Thanks once again for the inspiration and an excellent widget. Great widget...like it a lot. Yrga....if given permission from WickedP would you consider uploading that? Well done. Exactly what I was looking for. Thanks a lot.